Fellow apprentice of the magic arts, this is a compendium crafted from the knowledge of many archmages over the world. Scrolls from all magic academy libraries across Azeroth, once forgotten, now united in a large tome to teach you how to become a master of magics. Perception (active): Activate to increase stealth detection radius by 10 yards - lasts 20 sec - 3 min cooldown - Useful to see rogues, Druids etc. Escape Artist (active): Activate to break out of a Root or Snare effect - 1.5 sec cast - 1 min cooldown - More escaping abilities are always nice for a mage, short cooldown as well. Will of the Forsaken (active): Activate to become immune to fear, sleep, and charm effects - lasts 20 sec - 3 min cooldown - One of the best racials in the game (if not the most useful). Effective mostly in PvP against Warlocks and Priests. Underwater Breathing (passive): Underwater breath increased by 4x - It may have not much use for a lock, but sure it is a good racial mage-wise. Shadow Resistance (passive): All Undead get +10 Shadow Resistance - Nice racial against Warlocks and Priests in PvP. But remember, racials means almost nothing if you are skilled enough. 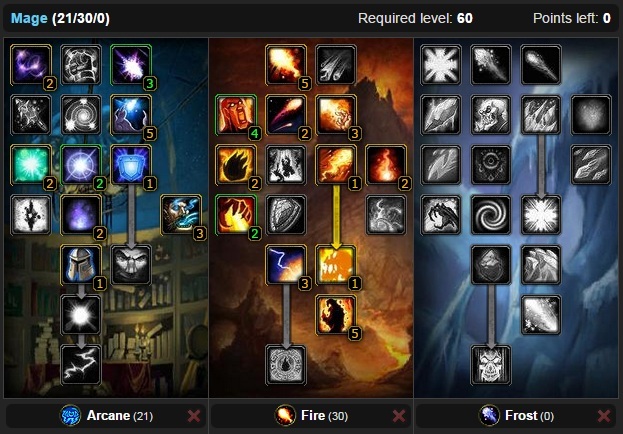 Each of mage's talent trees refers to a source of magic: Arcane, Fire and Frost. Arcane is mostly known by mages as a utility tree, Fire is the primary source for dealing damage and Frost is a survivability-based secondary DPS tree. Since this talent only applies to arcane spells, it's of limited utility. Most of the time you won't be casting exclusively arcane spells, however, there are a few notable exceptions to this. Higher level instances (e.g. Molten Core) typically have mobs immune to Fire which means that if you're not Frost, then Arcane Missiles is the spell to use. Reducing your threat by 40% will let the warriors hold aggro easier. Another application for this talent is when you're AEing. The threat reduction comes through and makes keeping elites off of you easier. All that said, this is very much a PvE only talent (threat doesn't matter in PvP); however, it can allow you to unleash more DPS in PvE without getting aggro, making you that much more effective in a group. This can be useful in both PvP and PvE(? ), but I can't say that I've noticed a tremendous difference on high level raid mobs with or without this talent. (Molten Core or Onxyia's level 63 raid elites resisted quite a bit whether or not I had the talent, and there wasn't a statistically significant difference from the data I collected). Also, the Warlock's Curse of Shadow, which also reduces Arcane resist, has far more noticeable effects on Arcane damage. Still, if you're going for 31+ Arcane build, this talent offers a viable place to drop spare points to unlock the deeper tiers. Also, preliminary testing indicates that Arcane Focus may make Polymorph's duration more consistent and longer in PvP. This allows you to do damage while getting beat on. Note that it only prevents to interruption from damage -- this talent does nothing against Silence, Shield Bash, Pummel, Kick, Earth Shock or any of the other spell-interrupting abilities. It's worth getting no matter what your mage will turn out to be as it has applications across the board. That said, you can safely delay getting this talent if you're interested in pursuing a different tree. Some people feel that it's a coin flip whether want to put 5 into this or 5 in Arcane Focus to get to the next tier, however, having an uninterruptible damage spell is very nice. Mages don't use wands enough to justify this talent's cost. Useful for leveling however. Increases all resistances by 10 and causes all spells you fully resist to restore 5% of your total mana. Any time you cast a damage spell -which is most of the time for a mage, you have a chance to proc Clearcasting and get your next damage spell free. Note that the Clearcasting effect fades after about 15 seconds so this talent isn't quite a 10% mana cost reduction because you might proc on your killing spell with no new target in sight (or yourself low on mana). You can also cast low mana cost/high efficiency spells (such as Scorch or Frostbolt) until you get a clearcast and then use a high mana cost spell (such as Arcane Missiles, Flamestrike or Blizzard) thus boosting your net mana efficiency. Very useful talent. Increases the effect of your Amplify Magic and Dampen Magic spell by 50%. Dampen Magic itself is a spell with rather limited utility. Useful against a lot of low damage caster mobs. Without the talent dampen magic at its highest rank reduces spell damage by 50 and reduces healing by 100. With the talent it goes to 75 and 150, respectively. Note that for periodic effects, such as Shadow Word: Pain or other DoTs, dampen magic only applies to the total damage not to each period, thus greatly lessening its utility against DoTs. Amplify Magic works the same way but amplifies the damage and healing. A great survivability talent, must have in all builds going towards arcane tier 3/4. 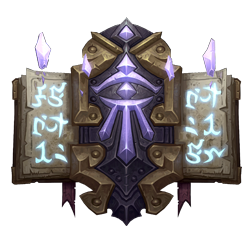 Decreases the mana lost per point of damage taken when Mana Shield is active by 20%. This makes mana shield more efficient. It might be worth the points, depending on how often you find yourself using Mana Shield. You might also want to pick up the Knight-Lieutenant’s/Blood Guard’s Silk Gloves (PvP reward: http://db.vanillagaming.org/?item=16487), which have a bonus of +285 absorb on Mana Shield. A very useful talent for PvP against casters, since four seconds can oftentimes be an eternity. Certain classes (priests come to mind) can be completely undone with a well timed Counterspell: Silence: an interrupted heal, no healing for 10 seconds and no casting at all for 4 seconds. You can also cast it before any spells are cast as a blanket silence; this is useful when you're frontloading on a target (presumably sheeped) and want to take away any opportunities they might have for counterplay. Paladin's immunity works through silence at this point in time, so keep that in mind if you find yourself fighting them. Silence complements an Arc/Fire or Fire/Arc build quite nicely. It's still nice to have in a Frost build. Not much use if you want to do PvE only, unless you really like to get some nice aggro! It's worth considering this talent if you're going to be spamming Frostbolt in Molten Core, combined with Mage Armor, you'll be able to get 45% Mana Regeneration while casting which begins to be somewhat substantial. Recommended for high-end PvE mages. Great for burst with Pyroblast and instant CC with Polymorph. If you're going for Arcane Power, it's worth putting points into getting more mana (there also aren't that many viable alternative places to put points). 10% of a 6000 mana pool is about 600 mana, not that much but also nothing to sneeze at. Some mages claim as long as they can provide themselves with +Intellect items, this won’t worth spending their talent points on. Since there are only a handful of ways for mages to raise critical strike chance, this talent is a gem, since it raises the crit chance and the damage of all of your spells, no matter what school they are. Required for having Arcane Power. When activated, your spells deal 30% more damage while costing 30% more mana to cast. This effect lasts 15 seconds. If you've put at least 30 points in Arcane, be sure to get this talent. Note, however, it is dispellable. Still, it is a 30% increase to damage for 15 seconds, excellent for upping your burst damage especially in PvP. In PvE, since it can produce aggro because of its high bursts, it seems not very reliable if you/your group are not able to manage the aggro. This is a decent DPS upgrade to Fireball. It's more notable at lower levels. In PvP, battles tend to use instants and not casting spells. It's probably the best place to first put points for mages since it at levels 10-14 it has a greater utility than any of the other first tier talents. Gives your fire spells a 10% chance to stun the target for 2 seconds. Useful in PvE, it truly shines in PvP where a stun will interrupt casting/stop the melee classes and also generally break players' rhythm. It procs off of all fire spells, making it a wise investment. A Flamestrike opener when AEing that stuns several of the mobs/players is very handy. Combusted Blastwave with this talent is absolutely devastating, especially if stacked with other mages. You'll sometimes get lucky with it and proc a stun at the perfect moment (e.g. right before an enemy finishes casting a heal). It's 40% more damage to your critical strikes, but since a crit is already 50% more damage, in effect this means Ignites adds 110% damage. A nice way to increase your DPS if you're focused around crits (and since our mana stat, Intellect, is our crit stat as well). A good place to put points. Note that it applies its damage as a DoT and thus can be dispelled. This lets Fireballs and Pyroblasts have 41 yd range (Flamestrike 36 yards), the longest range in game aside from Marksmanship Hunters. Useful in PvP (especially stand off situations) and those 6 yards can be handy in PvE in terms of getting another spell off or just more reaction time when soloing. Also in instances, the extra reach on Fire Blast is handy for taking our runners. Reduces the cooldown of your Fire Blast spell by 1.5 seconds. This talent has its uses. It can take your cooldown from 8 seconds to 6.5 seconds, which is noticable (primarily in PvP) but the question then becomes what you have to get up to get those 5 points for this Talent, and I'd rather have Impact or Ignite. Also, it isn't as if you can't cast other things while waiting for Fire Blast's timer. Still, this talent is personal preference and may work for your particular playing style. Fire Blast is a core PvP spell and Scorch can be a core PvE spell (because of its fast casting time you'll proc more Clearcastings per fight) and thus increasing the chance to crit on both these spells is generally a good thing. Very useful if you are trying a Scorch build (a popular PvE build). Increases the critical strike chance of your Flamestrike spell by 15%. You can Presence of Mind Flametrike, then follow with a Blast Wave and spam Arcane Explosions. Recommended to AoE mages. Hurls an immense fiery boulder that causes 716 to 891 fire damage and an additional 268 damage over 12 seconds. Don't get Pyroblast unless you get Presence of Mind. With sheep lasting at most 15 seconds in PvP and very often much less, you often will not be able to sheep, back up, and get off a full 6 second Pyroblast cast before your target is unsheeped. It's moderately useful in PvE if you're purely focused on mana efficiency (as an opener especially when soloing), but it truly shines with PoM. Since the additional damage is a DoT, it can be dispelled. If you're a Fire Mage, a Combusted Pyroblast is a thing to be feared and is useful when fighting especially tough mobs, but in all honesty, rarely will you have opportunity to successfully land a 6 second casting time spell in PvP. A critical of an AP PoM Pyroblast is one of the best burst damages in the game and can be cast while chasing a target (Blinking towards a fleeing enemy then unleashing a fiery ball of death is a fun thing to do). A good mage doesn't need this talent, since he/she keeps distance with his/her opponent. If for some reason you're trying to cast while getting hit, Improved Arcane Missiles offers a 100% chance to cast without interruption. In PvP, spell interrupts like Silence/Pummel/Kick aren't prevented with either Burning Soul or Improved Arcane Missiles and thus Burning Soul becomes relegated to casting when a mob is hitting on you and you don't have Arcane Missiles. It can be useful for with Scorch, however if you can often time your Scorches to cast and land between a mob's hits on you and you can almost always Nova and step back or CoC and blink away. I suppose Burning Soul can be useful to a pure Fire mage fighting archer mobs. The 30% threat reduction however is good for PvE, since Fire mages tend to get a lot of aggro with crits and powerful bursts. Your Scorch spells have a 100% chance to cause your target to be vulnerable to Fire damage. This vulnerability increases the Fire damage dealt to your target by 3% and lasts 30 seconds. Stacks up to 3 times. Most useful in PvE, as it is unlikely you will be casting 3 scorches on the same target in PvP. For a PvE mage (and Scorch builds), it can be a useful talent. Very effective during long boss fights. Causes your fire ward to reflect 20% of the damage absorbed back to the caster. Rank 5 Fire Ward costs 320 mana and absorbs 585 Fire Damage. You should consider that it is only useful against classes with use fire damage (mainly Conflagrate/Fire warlocks and Fire Mages). If you are having mana issues then this talent is worth picking, otherwise we have better talents to go with. More critical strikes (therefore more Ignites) on your fire spells. All around damage increase. Useful for a deep Fire Mage. A wave of flame radiates outward from the caster, damaging all enemies caught within the blast for 462 to 545 fire damage, and dazing them for 6 seconds. The daze is essentially a 50% snare. This spell might shine in Battlegrounds, but it's very situational and since it has a 45 second cooldown, you'll pretty much only get to use it once a fight. Still, another instant is always handy and the snare is useful for getting away from melee, even in 1v1 confrontations. Do note however, that if you get Blast Wave, you won't be able to get Arcane Power, therefore an Arcane/Fire Mage can out burst DPS a Fire/Arcane mage. More damage, all the time. Claimed not to be useful by many because of its long cooldown and the fact that PoM is superior to Combustion. The Frost Warding is way better than Improved Fire Ward because you are getting an extra 30% resistance bonus. However in PvP it is only useful against Frost Mages. Reduces the casting time of your Frostbolt spell by 0.5 seconds. Much like Improved Fireball, a DPS upgrade, letting you get a 2.5 second frostbolt at its highest rank and also allowing for a 1 second Rank 1 Frostbolt which is handy for snaring runners in PvE and PvP. This talent is useful for getting hit capped. An untalented Frostbolt that normally hits for 100 would crit for 150, but with this talent it would crit for 200. A core talent of a Frost build. Gives your chill effects a 15% chance to freeze the target for 5 seconds. A chance to proc a root off of any chill effect (including your Ice Shield!) which you can then Shatter off of. Another core talent of the Frost line. Incredibly fun to have this proc on a melee that attacks you, since they essentially freeze themselves (Frost Armor), allowing you to step back, cast on them, etc. Can be mildly annoying if you're solo PvE AE farming since it'll randomly proc on some mobs but on others, but this talent shines in PvP. Reduces the cooldown of your Frost Nova spell by 4 seconds. Required for Shatter, useful in its own right since it lets you unleash the Nova+CoC combo more often. Again, useful against melee classes. Increases the duration of your Chill effects by 3 secs and reduces the target's speed by an additional 10%. Typically frost mages will be chain casting Frostbolt, which means they'll always reapply the snare, making Permafrost not really doing anything in that situation. If you take Improved Blizzard further down in Frost tree, Permafrost may not be worth it since the chill is reapplied each wave. However, since Blizzard is resistible, it might be worth it. Depending on your particular build and playing style, may or may not be useful. Frost is much more about control than damage. Does offer a very slight efficiency bonus. Recommended for a MC/BWL Frost mage. When activated, this spell finishes the cooldown on all of your cold spells. Incredibly useful ability that lets you get off two Frost Novas, or two Cone of Colds right after each other. Also refreshes your Ice Block and Ice Barrier timers. Not to be passed up if you're a Frost Mage. Adds a chill effect to your Blizzard spell. This effect lowers the target's movement speed by 65%. Lasts 2 seconds (5 seconds with full Permafrost). Blizzard is not intended to crit (according to a Blue Blizzard poster), however the chill is reapplied each wave (conceivably this means Frostbite will also have a chance to be reapplied each wave). In many cases, in instances, this movement slowing ability is what you need to make sure enemies take the full 8 second damage when you start pulling aggro away from the tanks. If you are going to invest points here use this talent 2/3 this way it won't overlay the Cone of Cold slow. More range on Frostbolt/Blizzard (to 36 yards) and a wider Cone of Cold and Frost Nova. Debatable, and not as much of a must have as Flame Throwing is for fire, simply because the Frost playstyle is different. Once you get Frostbite, for example, you won't mind mobs hitting you so much since they might freeze themselves by doing so, enabling you to step back and get a Shattered Frostbolt on them. For PvP, however, more range is always good. This talent is also very useful in Molten Core, since you can stand just outside the 30 yard AoE range and nuke at your pleasure. Reduces the mana cost of your Frost spells by 15% and reduces the threat caused by your Frost spells by 30%. An efficiency upgrade for Frost. You might want to drop these three points in Improved Cone of Cold instead since you can gain mana by +Intellect items on your gear, and also due to the fact that Frostbolts don’t consume your mana like Fireballs, but it is your choice. Many people like Frost Channeling because they often cast Blizzard in MC, and having the mana cost of Blizzard reduced is a very nice thing. Increases the critical strike chance of your frost spells against frozen targets by 50%. Another core Frost Mage talent. What this talent means is that if you have chance to crit of 5%, then against frozen targets (e.g. Frostbitten or Frost Nova'd targets) you will have a 55% chance to crit. A well-played Frost mage milks Shatter for all its worth. But remember, only on frozen targets, not chilled. You become encased in a block of ice, protecting you from all physical attacks and spells for 10 seconds, but during that time you cannot attack, move, or cast spells. Required for Ice Barrier, this spell shines when AEing or in group PvP. It cannot be dispelled so essentially you can prolong your life for 10 seconds. If a pull goes bad while AEing or a healer is stunned, you can hit Ice Block and give the time to tanks to get the aggro off you. Probably the most valuable talent in Frost for group PvP, simply because you make yourself unkillable (granted, you can't do anything during those 10 seconds, but you stay alive and continue to pose a threat). Also removes DoTs, makes it very useful against Shadow priests and Warlocks (don't forget Warriors’ Hamstring). Furthermore, it can be used to make your PvP enemies stop hitting you and target someone else. Increases the damage dealt by your Cone of Cold spell by 35%. A useful upgrade to Cone of Cold. This lets your crit Cone of Colds hit for about 1000. A part of the nice “Frost Nova-Cone of Cold combo". Sometimes you can even, Nova, Frostbolt, and Cone of Cold quickly and get both to crit using the Shatter off Frost Nova. Gives your Frost damage spells a 100% chance to apply the Winter's Chill effect, which increases the chance a Frost spell will critically hit the target by 2% for 15 sec. Stacks up to 5 times. Instantly shields you, absorbing 818 damage. Lasts 1 minute. While the shield holds, spells will not be interrupted. It's on a funky two minute timer, can be overwritten by Power Word: Shield and ever worse, can be dispelled. However, when solo AoEing, it's very useful since it gives you an ability you otherwise wouldn't have available. It'll save your life many times in PvP. Spell not being interrupted is good however. Last edited by Jace on Thu Feb 26, 2015 11:05 pm, edited 2 times in total. There are certain mobs that are resistant to Fire in the blackrock mountain instances, but just use frost spells against those mobs. Enjoy playing Fire while it lasts, because the moment you start to venture into Molten Core, you won't be playing Fire anymore for a very very long time. For Molten Core and Blackwing Lair the only sensible option is frost. There are 2 frost-options. 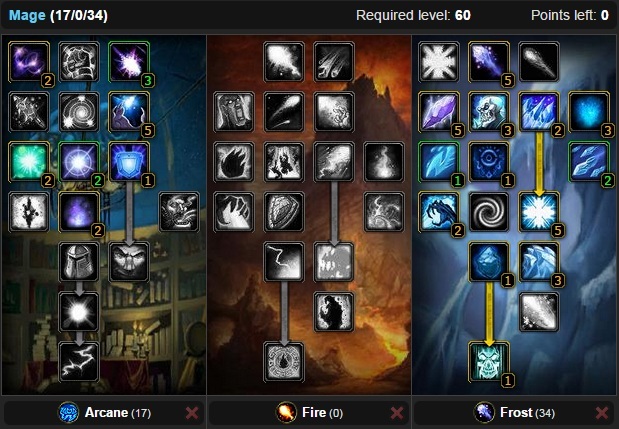 The Winter's Chill-stacking spec, and the Arcane Power-frost spec. Winter's Chill adds 10% crit chance to all Frost spells from all mages in the raid. It is a must that there is atleast 1 mage in your guild who joins the raids with these talents. It is a common procedure that the newcomers in the guild gets asked to spec Winter's Chill while the better geared mages use the Arcane Power variant, however having some of the most experienced mages use Improved Blizzard is probably the best way to progress through the Suppresion Room in Blackwing Lair, and should not be left in the hands of the newcomers neccesarily. Having all mages spec into Winters-chill Spec (or some variant) can also be useful when your guild is trying new content where there is raid-damage involved. Having Ice Barrier and Ice Block will take some stress of the healers. The longer the raid survives, even if you're not getting the kill, the more up-time you have on the encounter to learn and adapt to the mechanics. For Ahn'Qiraj Temple and Naxxramas you will be using Fire Combustion in most of the raids. For some fights, frost talents really help out, but if your guild has started naxxramas, you hopefully don't have much use for tips on what to spec anymore, so let's just skip that. Vs target of your own level +1: 5% chance to miss. 4% chance to Hit is needed for cap. Vs target of your own level +2: 6% chance to miss. 5% chance to Hit is needed for cap. Raid Bosses are considered level 63 when calculating hit. Therefore you need 16% Hit in order to be capped on raidbosses. You will gain 6% chance to Hit from talents, so the last 10% must come from gear. Being Hit-capped can be a hard nut to crack with blue gear. You shouldn't sacrifice too much Spelldamage in order to reach the Cap. Before you are in AQ40, you can easily get away with around 5-6% Hit from items. Remember that the Hit-cap is only needed for bossfights. As long as you have the talents, you will basically be safe on every trash pull you do. Your polymorphs or Counterspells will not be resisted (or well only 1% of the time) so consider +Hit as a purely dps-stat which has no importance in terms of cc resists etc. Your primary stat for your damage. As a caster you do not benefit from stats the same way as melee dps do. 20 agility for a warrior is 1% crit. However we need 59.5 intellect to gain the same 1% chance to crit with our spells. Bottomline is that intellect isn't worthless, but it should be sacrificed in order to increase spelldamage in almost all cases. Any item without +spelldamage is basically a throw-away item. Chance to Crit is a great stat. For Frost it is just as valuable as Hit, and should be considered of same value in terms of dps. For Fire, Chance to Crit is slightly more effective than Hit. The more spelldamage you have, the more you will benefit from 1% additional chance to crit. As fire you will do 210% spelldamage on a Critical Hit, and have a chance to replenish the Ignite timer should you also get a Critical hit on consecutive spells, resulting in a massive damage increase when you have multiple crits in a row. So what you want to do when looking at an item is to convert the Crit and Hit into spelldamage and then compare it to another item. Whichever item has the highest amount of total spelldamage, use that one. Stamina is allright, but don't overdo it. In most raiding situations, if you're taking damage it means you're standing at a wrong spot. Whatever stamina that you end up with after prioritizing solely on +spelldamage items, is what you're going to end up with. Don't worry about it. Don't pull aggro and don't stand at a bad spot, and you'll be fine. Intellect grants 1% chance to crit for every 59.5 intellect, and increases your mana pool with 15 mana per intellect. Seen from a dps-point of view, this is not a very useful stat. Get whatever intellect you can from your best possible +spelldamage items and that will be fine. Compensate with Major Mana Potions if you're going out of mana. Spirit and Mana/5seconds. Well, these stats are absolute garbage in my oppinion. I'd say that 1 mana/5 seconds is equal to 1 spelldamage. Others may disagree, but fact is that there are just not many fights out there which lasts so long that you end up going out of mana. Players have resistances to one or more spell-schools. In battlegrounds players may have shadow protection, mark of the wild, paladin auras or totems that increases player resistances, so having spell penetration is quite useful in PvP and should not be forgotten. However this guide will focus on spell penetration from a PvE-point of view. The trash mobs in Molten Core will have high fire resistances or even immunity. Mages would spec Frost there and so spell penetration would only be neccesary for the bosses. All bosses have resistances to all schools (fire, shadow, nature etc. ), different numbers depending on the school and the boss. Some bosses are more resistant to Shadow, some are more resistant to Nature, etc. This boss resistance means that a part of your damage will be reduced unless you find ways to reduce the enemys resistance. Warlocks can cast Curse of the Elements and Curse of Shadow. When these 2 curses are on the mob (you will need 2 warlocks), Shadow, Arcane, Frost and Fire resistance on the target is reduced by 75. It is not possible to reduce a player or monsters resistance to less than 0. When you cast on a mob, the first thing that happens is the Hit roll. Meaning that you need Chance to Hit to overcome a level difference for example. This is before resistance is added into the picture. Vs target of your own level +3: 17% chance to miss. 16% chance to Hit is needed for cap. Spell Penetration will only increase the effect of spells that already have succesfully landed on the target. However, even spells that land have a chance to do nothing at all if the mob resistance is very high. That's what spell penetration is for. Miss is when you don't have enough Chance to Hit. Resist is when you don't have enough Spell Penetration. That being said, our combat log doesn't make it easy for us to see what's going on. For some reason even when a spell misses, it will show as "resisted" in the combat log. Keep this in mind when you observe combat logs. But for the sake of understanding the mechanic we'll just have to be aware that there is a difference. Some spells will either do their full effect or none at all. It is not possible to have 50% of your counterspell be resisted. Binary spells will also be affected by the targets resistance, but their chance to resist will be the "average dps lost" percentage. Casting a binary spell on a mob with 100 resistance will mean that it gets fully resisted 25% of the time. Casting a non-binary spell on a mob with 100 resistance will mean that it has 1% chance to be fully resisted, 4% chance to deal 75% less damage, 19% chance to deal half damage, 47% chance to deal 25% less damage, and 29% chance to deal full damage. You will need to bring the monsters resistance all the way down to 0 if possible to deal your full damage. A simple rule of thumb is that each 10 spell penetration adds 2.5% DPS increase on average. Raid Bosses everywhere have: 145 resistance to Fire, Shadow, Frost, Arcane. 70 resistance to Nature, 15 resistance to Holy. Note: Some may have slightly different resistances, and for example Ragnaros have extremely high Fire resistance. But the numbers above are accurate in 80% of the cases. After Curse of the Elements and Curse of Shadows have been applied, you will need 70 spell penetration from gear to reach the cap in abomination wing. Mages need only 60 because they get 10 from the arcane talent: Arcane Subtlety. Last edited by Jace on Mon Oct 05, 2015 6:45 pm, edited 4 times in total. With the focus of many complains being PvP survivability in group PvP, I thought I’d put down some of the hints and tricks and general tactics for improving Mage survivability in group PvP. Get better gear. You need a good balance of +damage, stamina, and intellect. You should aim for a minimum 3.3K HP, and around 5K mana. You should also try to get more stamina than mentioned, as this provides your buffer zone, and determines how long until you have to bail out. The exact amount of Stamina will more than likely be determined by what amount of +damage you are comfortable with. You need at least 3.3K though. That should be the priority. Once you get that start trying to up the +damage. You can get away with as little as 5K mana buffed, but when you are happy with the other stats, try and get this up to 6K so that you can use Mana Shield more often, and last longer. The best gear for PvP is the PvP gear sets, but they take time to obtain. To my mind this is the big problem. All the gear in the world wont support the playing styles I often see in PvP, unless you have a backup healer, which will only happen on really good team, then the gear might provide you with enough survival time for a heal. So what’s the problem with playing style then? It’s the gung-ho, charge into the middle, AoE, fire instants, and die. The minute you commit yourself to these tactics early in an encounter you are basically about to die. Sometimes you have to do it, to prevent flag caps, but you should realize that it is a suicide attack more often than not, and really doesn’t allow you to effect the outcome of a fight. You are not a front line assault class, but a long range support, or AoE finisher, and Crowd Controller. So what playing style better maximizes survivability and the potential for unloading damage? It’s a defensive playing style, with an emphasis on defeating attempts to focus fire on the mage. The biggest killer for a mage in group PvP is getting focused on at the start of the fight, and killed very, very quickly, with no chance to do anything. Most people when they focus on someone they tend to attack them until, they are dead… only the better players switch targets or pick opportunity targets as they appear. The more damage you have caused to a target, the less likely you are to break focus on that target. Thus the key for a mage, is to prevent being focused on at the start of a fight, and only starting to unload after the enemy team have picked up other targets, and are attacking them. This will leave the mage free to pick a target, and get in a few free hits before being noticed. With the large chunks of damage that a mage can produce in one go, this can be very effective in supporting your team… particularly if you take out hunters, or assist warriors/hunters and focus on their targets. There is nothing more disconcerting than to be fighting a target, taking moderate damage but doing well, and then suddenly a big spike of damage comes in from off your Radar. That is what we should be seeking to do to other players as mages. So how to avoid being focused on at the start of a fight? Try to start fights behind your group, and only engage after everyone else has started fighting. Don’t open up ASAP, let people settle on other targets before moving into range. So stay back initially, hide in bushes (can be effective), and move in a few seconds after the fight kicks off. DON’T start fights near the front lines, or Blink in to AoE before the enemy have picked targets. That’s a sure way to get focused on and killed. The first 5-10 seconds of a group PvP fight are the most critical for targeting purposes, and it is the goal of a mage to make sure they survive these first critical stages of a fight, without being targeted at all if possible. This is massive and the main way to break focus. It’s a real killer when it doesn’t work unfortunately. The minute you notice you are getting targeted and start taking damage, turn around blink and run, until the focus breaks. If they keep following you, keep running, you’ve taken at least one person out of a fight (keep an eye open for a chance to take them out if they are on their own). Don’t wait to do this until you swallow an Aimed Shot, the minute you start taking even small damage, run. The person targeting you, unless they have caused a lot of damage and thus think they can get an easy kill from you, will be more likely to break off the attack, and pick another target in the core of the fight. Leaving you free to turn back and start nuking again. Against some melee classes, try to get a Nova out before the blink, but don’t hang around too long. To me there are two talents that are necessary for a mage these days. Evocation for PvE raiding, and Iceblock of group PvP. (you can make a good argument for Improved AE too and Improved CS, which means most mages are forced into Arcane). Iceblock is fantastic for breaking focus at the start of a fight, where you got caught up in the melee. Warrior, Rogue and Hunter target you at start of a fight, if blink would take you the wrong way, and there is no time to turn, then Iceblock ASAP. Don’t hesitate. Do it when you have as much health as possible. Then stay in it. At the start of a fight this will force those that were focusing on you to pick other targets. The minute they have done so, break Iceblock (then use Coldsnap to reset the cooldown on it), make some distance and open up on some targets. Ideally use it when you still have plenty of health. As with all focus-breaking, if you are on low health people are more likely to wait out Iceblock for the chance of getting a kill. This is surprisingly effective in group situations. Keep it up at the start of every fight, for those few extra HP to help you react when focused on. When running from an enemy keep it up, particularly vs hunters. It can burn up a lot of mana, but the important thing is to give you time to react. I find it most useful vs. hunters Autoshot, with the big hitters they just blow it away, but it still gives you some precious reaction time. The minute you start taking damage, particularly in the early stages of a fight, run/blink/block. If they cause you too much damage before you run they will follow you, hunting for the kill. So break and run early, and return back the fight the minute they break focus, and stop pursuing you. So you should be getting the picture. Stay on the periphery of fights, break focus and run the minute someone targets you, keep distance, and unload the big damage spells. Save your instants for when you get caught in 1v1s, have to run in to disrupt attacks, or need to burst a target down quickly (after a Counterspell for instance). The main classes that can give you problems if you do the above, are Warriors who will follow you with Charge, Intercept etc, thus preventing you from breaking their focus with Blink, and Hunters who will often run after you, and send pets. Against Warriors the most effective approach is to Nova them, and if you think they will still follow you then sheep them also, then run off, or ignore them for a bit. Most Warriors will break off the attack when Frozen, so Freeze, Trinket out of hamstring and run. Against Hunters keep your Mana Shield up and run out of range. If they follow you, so be it… get them on their own, blink in (if they are following you they wont have a trap), snare them and try to blast them down with instants. This can be tough though… hunters are the worst enemy to get targeted by. The quicker you start running from them when you see incoming damage the more likely they will be to break off the attack. It is a fair bit harder to pull this off as a non-frost mage, but the added plus that if you do survive the first bits of a fight, when you start unloading you cause a huge amount of damage. As a frost mage my feeling is that you can afford to sacrifice more stats for +damage, whereas a fire mage needs to keep their stamina up, and mana, to enhance their survivability. Mages still suffer a lot at 60 when in blue gear, as it is hard to balance the stats, and blue weapons for melee and hunters can still be hugely effective. When you start to get more epics things become better, particularly the more slots you get … but remember if you aren’t going for a PvP set, stay away from the pre-Tier2 mages sets as a whole. The odd mage set item is worth it to balance some stats such as Int, and sometimes stamina, but generally you will want more +dam. The above is not to say that mages don’t need a buff in survivability, especially non frost mages, but it can provide a more realistic way of coping until that day happens. I’m telling you, when you survive long enough to start pumping out your damage at unsuspecting targets, using the longer cast bolts in particular, you will be much more satisfied with your mage. This is not supposed to cover all situations, but is more a general playstyle philosophy, and there will be many times you will deviate from it, in specific situations. As an interesting aside, this is why Invisibility would be a huge aid to a mage. Not for nuking out of nowhere, or for aiding in 1v1 PvP, or even as an escape mechanism - but by preventing mages getting focused on at the start of fights in group PvP. That’s a discussion for another time though. PS (originally by Mustard from EU-Burning Legion): Out of mana? kill yourself (a mage with no mana is like a warrior trying to fight with a fishing pole). A good way to do this is to 'pull' enemies out into the middle of nowhere, on the promise of an easy kill. You were going to die anyway, but you take them out of the action at the same time, and away from their flag, if you're lucky, allowing your teammates to get the advantage. Duelling (1v1 PvP): Duel a lot! Duelling is a fun way to learn your abilities, spells, knowing other classes' abilities and getting stronger in 1v1 PvP. Duelling will make you quicker and more experienced in order to control your enemies better in real PvP situations. However, duelling is not all about fun. What I mean by duelling here means 1vs.1 outdoor PvP: you against an enemy. Mages are not the best 1vs1 PvP class, however, they are not necessarily a "loser". They can’t dish out loads of damage to their enemy in a short time and have escape abilities which make them be able to run away from their foes before they get killed. Group/Mass PvP is where the game is balanced around. A mage might not be the best solo PvP class, but he/she shines in group PvP. Group PvP is usually happens in Battlegrounds nowadays, unlike the first few months after the release of WoW (still missing those massive Ogrimmar raids). In this part I will try to give you some tips and how to use your mage in Battlegrounds. The role of mages in WSG is very dynamic. They can defend their flag using their crowd control spells such as Polymorphing the healers or the flag carrier. Also Frost Nova and Frost spells are great for stopping/slowing the flag carrier and/or his team mates. Using Blink, they should take the "Speed!” boots before the enemy's flag carrier. Counterspelling priests or warlocks who can fear more than one target at a time (especially priests) is very important too. I've seen many priests Insta-Fearing all the people in our base, making an easy flag-pick for their team. Mages can also hold the middle while in a group. They can AoE, CC and nuke the enemies. One of the other tasks mages can be given is taking the flag or support their flag carrier. Mages can Frost Nova in the enemy's base, freezing the defenders to the ground and let their ally flag carrier to take the flag more peacefully. Also Frost spells can slow the enemies to reach your flag carrier, especially CoC and PoM Frostbolt can be very useful here. Also polymorph helps a lot to take an enemy out without any difficulty. Counterspelling/Plymorphing the enemy crowd controllers is another job which can be assigned to mages. Sometimes, mages can assault the flag, Blink helps here a lot. Mana shield can save your from physical attacks in many occasions, don't forget using Ice Barrier if you have it btw, and crowd control spells are extremely effective here to take an opponent out temporarily. You may use speed potions such as Swiftness Potion etc. as well as healing or mana potions while carrying the flag. However, due to the lack of survivability of mages, bringing the flag to your home base isn't very easy and even if you could reach your base, you better swap the flag to a druid or paladin etc. Be careful when using Ice Block (perhaps for removing your DoTs?) while you are carrying the flag as the flag will be dropped. Arathi Basin is probably the toughest BG in the game for me as a mage. A mage can't defend a resource node on his/her own in many cases. So usually mages should be grouped with a non-mage class in defending a place. Mages are good delayers though: they can interrupt the enemies who are taking the flag with the help of their instants and also Arcane Explosion is a very nice interrupting spell. During this time, when the mage tries to annoy the enemies, he/she calls for more help in that node. This saves the flag uncaptured but you'll die most of the time in these situations (sometimes you hate to do this for the sake of your group). The basics of the PvP nuking is range. A good mage steps back or even hides behind his/her group and then starts to nuke. When the enemies have targeted your tanks, this is your time to shine and nuke. Try to nuke from different places behind your group, because after two-three spells, you are most likely to be targeted (if not earlier). Trying different targets may save your life since you won't have your enemies’ attention, but isn't a perfect idea. It is better to take your opponents one by one i.e. everyone should better focus on one target and take him out as fast as possible (like strategy games). You should better try to hit those enemies warriors and hunters have already focused on to take them down faster. Hitting the targets which are already fighting reduces the chance of being focused by them as well. AV is where the mage shines at its most. In AV, the classes which can deal damage from distance are most favoured. Due to the high population of AV, AoE's work great here. You can do 10k damage every second due to your powerful AoE's, however, not very long lasting. The Frost spells shine here as well: the chill effect reduces the speed of melee classes, making them impossible to come close to your group. Blizzard is very useful in AV too. Channelling Blizzard (along with Warlocks' Rain of Fire) on bridges guarantees that no stealth rogues/druids can pass by. In AV, you don't have a very definate role as you had in the other two Battlegrounds maybe because of AV's high population. You can do the quests inside AV or join your allies in the conflict. Your major responsibilities are dealing damage- whether single target or AoE, crowd control, and conjuring food and water for your team mates. + Ice Barrier absorbs both physical and magic damage, making warlocks actually killable without a 3 minutes cd. + Ice Block and Cold Snap adds an arsenal of escape-ways, which really help out if you're running with 2.5k health. Or if you are overgeared and like being a ranged tank. + Shatter, which opens up for "Frost Nova -> Frostbolt -> Cone of Cold" which can be a great burst even with average gear. + Improved Blizzard is a great talent, make sure to only take 2 ranks of it so it doesn't block cone of cold from getting applied. + Unless you spec Arcane Power, this is probably the best spec to defeat Shadowpriests, Warlocks and Hunters, which are the 3 main counters to Mages. - Paladins with Blessing of Freedom can make it very hard to finish off a flagcarrier by yourself, as you have to set up a burst which requires Frost Nova. Shamans can purge (remove) your Ice Barrier away and frostbolt won't be useful because of earth shocks (interrupt) short cooldown. - Your primary damage spell has a 2.5 seconds cast-time, and you will be very vulnerable to spellpushbacks while ice barrier is not up. + PoM + Pyro is great Burst and don't take any build-up. + Blastwave is like a mixture of Cone of Cold, Fire Blast and Frost Nova. Is more forgiving than Cone of Cold because you may miss with Cone of Cold even if the target seems to be standing right in front of you, which does not happen with Blastwave. It's also an additional instant-cast to your burst rotation which makes a big difference. + Scorch does not fly through the air to reach the target, you may be able to do some damage before the enemy spots your location. + Scorch only has a 1.5 sec cast-time. You also have talents to reduce spell-pushbacks, which makes a huge difference. - Lack of Survivability. Most of the times if you kill that Shadowpriest or Warlock with your cooldowns, you still die to the DoTs afterwards. Hunters eat you alive unless you have very good gear. Instead of your spell casting when you release your keybind, it casts when you press it down. So normally it would go: key press, key comes up, spell casts. With the addon it goes: key press down, spell casts, key comes up. Arcane Missiles: Has a long range which can be used for hitting fleeing targets. Arcane Missiles turns with respect to your target automatically. I frequently use it to slow down my enemy’s casting. AP PoM Pyroblast: I usually use it as a "finisher". Don't lose your (AP) PoM (Pyroblast) at the start of the battle especially against healer classes since they heal themselves and become back to normal. I rarely used my AP PoM Pyroblast when I was Arcane/Fire because I always wanted to keep it for special occasions (blowing the last hit on the flag carrier for example in WSG), so don't lose it for nothing. Ice Block: A spell with tens of uses, from breaking PvP/PvE focus to removing DoTs, Fear, Hamstring etc. Note that there's about a 1 second casting animation lag' between hitting the button and actually getting Ice Blocked, so don't wait too late to hit it. I play with about 50 ms latency (ping) and have seen the Ice Block animation go up and found myself dead anyway because of latency, so keep that in mind. Frost Armor: Use it against melee classes , hunter pets etc. Polymorph: Know that you can cast polymorph regardless to where your face is pointing to i.e. you can sheep a target while your target is behind you. This works extremely useful after Blinking, when you are most likely to be back-to-back to your target. Frostnova: Remember it deals a little damage to your target as well as freezing them, therefore using Frost Nova would de-sheep the polymorphed targets. Scorch: Scorch is a good “finisher” because of its short casting time when you have your instants on cooldown and you don't want lose too much mana. Also scorch is a mana-efficient spell in high-level PvE if you have Arcane Concentration as a talent. Statically you'll enter a Clearcasting state after casting 10 Scorches when you can then cast a mana-eating spell. This tactic is good during long fights in dungeons and you won't lose too much mana, therefore your damage output will be more stable than a Fireball spammer and you'll get less aggro. Except for at the start of the BG, don’t buff yourself with Arcane Intellect, it costs too much mana. Have your Rank 1 spells out: Rank 1 Fireball (Fireball's DoT on rogues make them unable to vanish, remember? ), Rank 1 Frostbolt (chill effect) on your screen and/or key bindings. Rank 1 spells have less casting time than higher ranks but do the same job (DoTing and chilling), of course with less damage and mana cost. While mana efficiency is not always the primary concern in PvP, often times you will need a target slowed instantly and won't have the time to cast a rank 1 frostbolt. In those situations, it is usually better in the long run to cast rank 1 COC, instead of wasting mana for subpar damage just to get your target in a slow. That being said, I don't really use rank 1 COC in PvP all that much, because improved coc + shatter combo is a devastating amount of damage that I personally wouldn't want to pass up on. As far as Rank 1 frost nova is concerned (which is what I think you mean by 30 second CD rank 1), the difference between rank 1 frost nova and max rank frost nova is minimal. The only thing you get for max rank frost nova, is a small increase in damage and a great increase in mana. In vanilla, Frost Nova only serves as an AOE root, it is not really used as a damage spell. Therefore, you end up paying more for the same effect. I think its ultimately a better idea to rank 1 nova to conserve the mana, and use the mana you saved on more expensive, devastating spells, like Cone of Cold and Blast Wave (both expensive, both crit for big numbers). Last edited by Jace on Thu Feb 26, 2015 10:54 pm, edited 1 time in total. Would like to add the Consumables/Enchanting part from the Vanilla Mage Guide for our 1.4 server release if you already made the research please let me know. Last edited by Jace on Mon Oct 05, 2015 6:47 pm, edited 1 time in total. winters chill does not stack 15 times. Momoh wrote: winters chill does not stack 15 times. Thanks for telling, some typos go through revision. However, could you elaborate on these numbers ? Notably on the Holy resistance. Holy is not represented in your character sheet in game because every player has zero resistance to holy damage and there isn’t any item in game that can raise it (there is the Holy Protection Potion which absorbs holy damage). However bosses do have holy spell resistance. Holy resistance does not currently exist as a visible or collectible statistic in World of Warcraft. It only exists against PvE targets of a higher level. People reached these numbers with tests and data collecting on bosses since blizzard didn't tell the exact value. The average % of spell resisted against a boss will tell you the value of the bosses resistances (you can compare in the spell resistance sheet).